Playing music transports us to a better place. More than that, the act of learning to play actually rewires young children's brains for the better. Music is as good for our well-being as it is for cognitive function. What's more, the skills children learn from the study of music help prepare them for their future academic and life success. It may be surprising to discover that your very young child wants to play the violin. Now is the perfect time to begin! With The Suzuki Method I can start students as young as three. 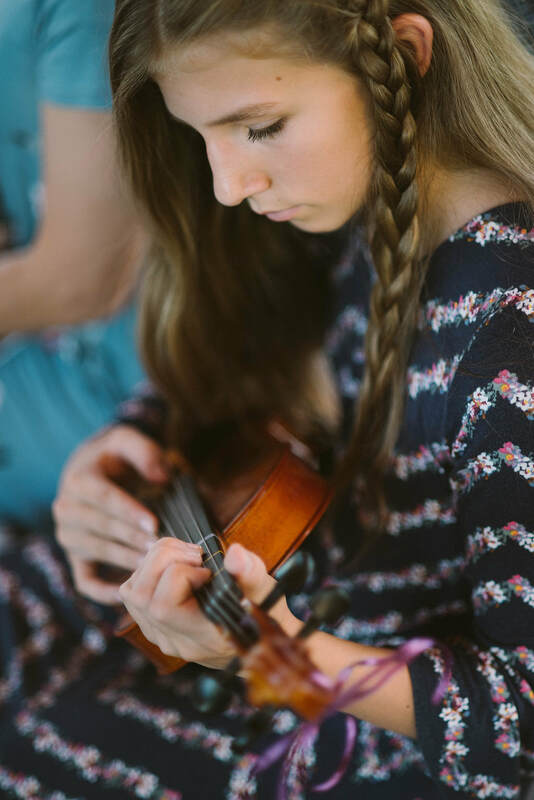 ​I remember the excitement I felt as a beginning violist and look for that same spark in each and every one of my students. I can’t wait to lead you and your child on this incredible journey! Dr. Shinichi Suzuki developed his ideas about talent education at the end of World War II. The Suzuki Method is often referred to as the Mother Tongue Approach. What does that mean? With The Suzuki Method we teach music the same way we learn language. Do you remember when your child learned to talk? Lots of repetition and lots of praise for one word at a time. The next thing you know, she is forming sentences. It is thrilling to be a part of that progress! And Dr. Suzuki discovered that it works with music too. Instead of repeating words, we sing and play the pieces we are learning and listen to the Suzuki Method recordings topped off with a heaping helping of praise and hugs! I had taught violin and viola for several years before I took The Suzuki Method teacher training. Everything about the method--the emphasis on character development of students, the teachers' commitment to continuing education, the Suzuki community of shared resources, the parent involvement, the perfect method for teaching very young children, group lessons and the success of many, many students--has me convinced that this is the best way to teach string instruments. "I made it into Western States!!!!!! I'm so excited and surprised! Thank you for all the advice and help you gave me for this audition, Sarah!" 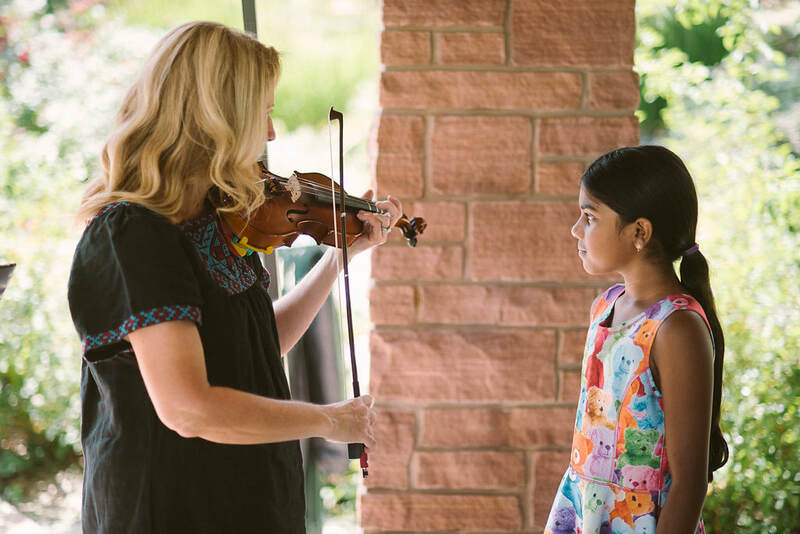 ​​"I recently moved to the area and was apprehensive about choosing a new violin instructor for my child... our previous teacher was tremendous and I was worried about keeping my child's zeal, for the violin, at the same level as it was in the beginning. I feel more than privileged to have my child be a student of Sarah Richardson! She is yielding but not passive, which helps to keep my child focused and also helps to maintain respect. Sarah introduces new pieces at the appropriate time and she allows my child to become confident before moving on too quickly. She also keeps him involved in the conversation and asks him what he is comfortable with while, at the same time, encouraging him to push forward. I am happy with our choice and hope that Sarah doesn't retire anytime soon." "More importantly is that he really enjoys it and loves his lessons. You are absolutely right, I love the time we spend practicing together and trying between us to figure out new pieces. We both take accolades together. It is really quite special!"